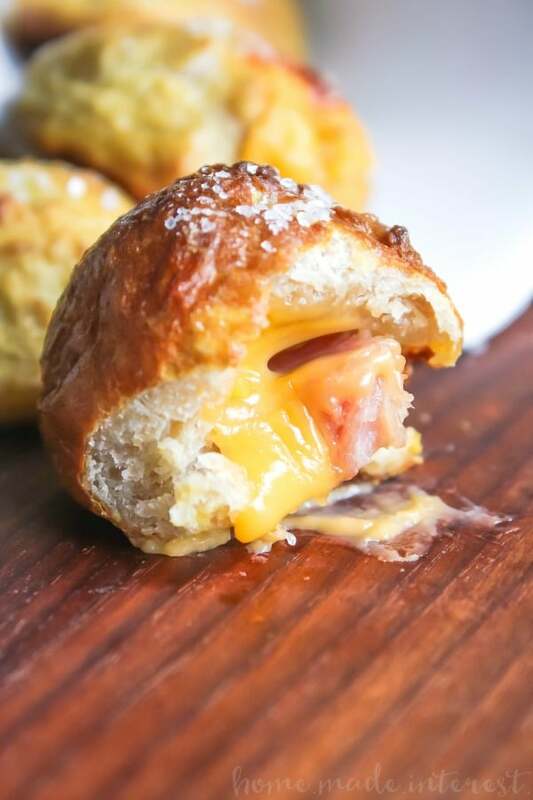 Ham and Cheese Pretzel Bombs - Home. Made. Interest. 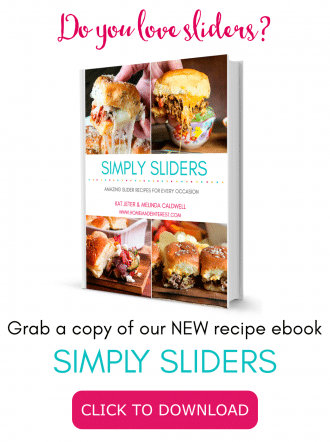 We’re so excited to be partnering with Smithfield to bring you today’s recipe! All thoughts and opinions are 100% our own. These Ham and Cheese Pretzel Bombs are an easy appetizer recipe that is a great way to use leftover ham. 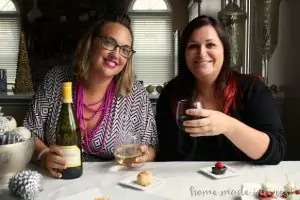 Did everyone have a good Thanksgiving? I’m still recovering from all of that food and shopping! I had a great time with friends and family over the holiday weekend and now I’m in full-on Christmas mode. I’m planning menus for holiday parties, brunches, and dinners, and from now until the end of the year it’s all about ham. 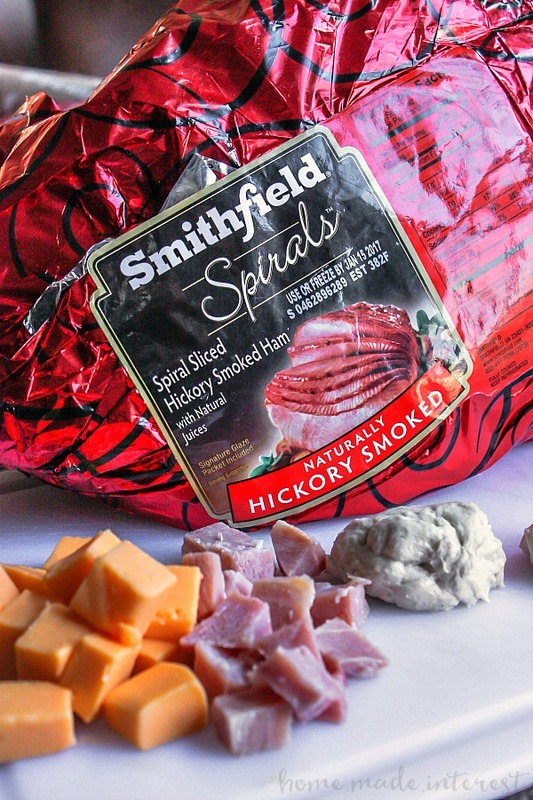 Whether you’re making a Smithfield Spiral Sliced Smoked Ham with Signature Glaze or trying one of their different flavors like Pecan Praline, Salted Caramel, or Brown Sugar, it wouldn’t be Christmas without a Smithfield Spiral Sliced Ham on the table. All of that ham means leftovers and I use them in everything from soup, to sandwiches, to breakfast casserole. Today I’ve got a super delicious, fun, cheesy recipe for using up all of those ham leftovers, Ham and Cheese Pretzel Bombs! 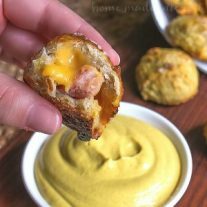 These awesome little bites of ham and cheese goodness are an easy appetizer recipe that would be fun for holiday parties but they’re going to be even better for all of those game day parties between now and the big game in February. Now I know it might sound a little intimidating to make pretzels but I’ve got a secret that makes these super easy to make. 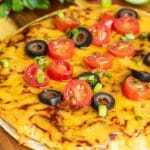 While you can make your own homemade pretzel dough you can take a little shortcut by using pre-made pizza dough from the grocery store. Don’t buy the canned stuff you want fresh pizza dough! Once you have that cube up some pieces of leftover Smithfield spiral sliced ham and American cheese and you’re ready to get started. Roll the dough into 1 inch balls and then flatten then out. place one cube of American Cheese, and one cube of Smithfield Spiral Sliced Ham on each piece of dough and gently push the ham and cheese in while pulling the dough around them. Pinch the dough together to make sure it is sealed. Stuff all of the dough balls and then drop the balls into a hot baking soda water bath 4 or 5 at a time letting them boil for 20 seconds then remove with a slotted spoon. Brush the dough balls with an egg wash and then sprinkle with salt before placing the pretzel bombs in the oven and baking at 400 degrees F for 15-20 minutes or until dark golden brown. A little cheese will most likely leak out so don’t worry it’s totally normal :). What you end up with are these amazing, cheesy, ham-filled pretzels that are soft and savory, and perfect for dipping in mustard or ranch dressing. 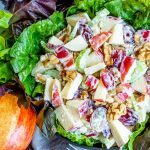 You can make them for a New Year’s Eve appetizer or as a snack for the big game, either way they are a great way to use up those ham leftovers. Ham and cheese pretzel bombs are an easy game day appetizer that are exploding with cheesy goodness! While you wait for the water to boil roll dough into one inch balls (you can use a little flour on your hands if it is too sticky). Flatten the balls and add one cube of Smithfield Spiral Sliced Smoked Ham with Signature Glaze and one cube of American cheese to each ball. 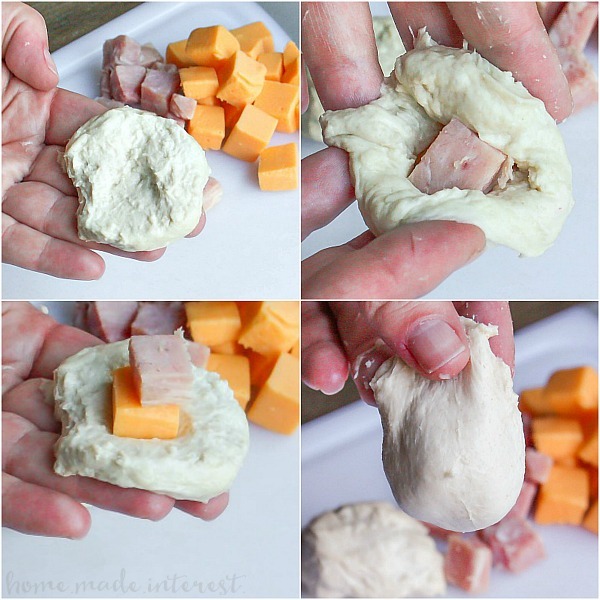 Press the ham and cheese gently into the dough while pulling the dough up and around the ham and cheese pinching the ends tightly closed to seal it. Add the baking soda to the boiling water (go slowly it will bubble up!) and stir until it is dissolved. Add the pretzel balls to the boiling water 4 or 5 at a time, letting them boil for 20-30 seconds before removing with a slotted spoon and setting on a baking sheet. Once all of the pretzel bombs have been boiled mix together the egg and water to make an egg wash and brush the wash over each of the balls. 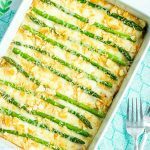 Sprinkle with salt and then place them in the oven to bake for 15-20 minutes or until dark golden brown. 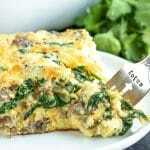 For more meal inspiration and recipe ideas, visit www.Smithfield.com or Facebook.com/CookingwithSmithfield. I’ll have to give it a try without the egg wash!